Hurricane Andrew made landfall in South Florida on this day in 1992, and its effects have been felt ever since. FLORIDA -- In the middle of a dark, squally night 26 years ago, South Florida and the people who lived there changed forever. Hurricane Andrew and its ferocious gusts blew through Miami-Dade County just before 5 a.m. Aug. 24, 1992. The storm was one of the most intense to make landfall in the U.S. and, for many years, was the costliest natural disaster. Andrew's legacy would immediately be felt during the storm, the hours after and in the years to come. "It was like it wasn't real," Phillis Green told 10News during the storm's 20th anniversary. "It couldn't be happening to us. I mean, it was surreal." The storm originated, like many Atlantic systems, as a lowly wave emerging off the west African coast on Aug. 14. It would become better organized over warm water with little atmospheric influence to disrupt its development. 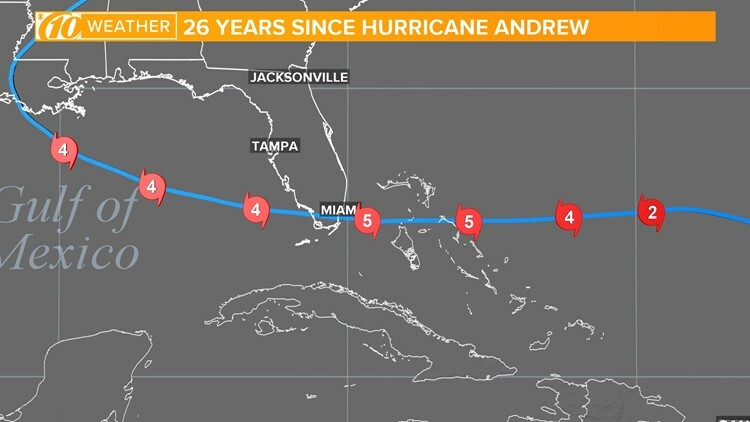 Andrew was named as a tropical storm three days later, becoming a hurricane on Aug. 22. It then underwent what meteorologists call a period of rapid intensification: Andrew's pressure dramatically dropped and winds drastically increased as took aim toward the Miami metro. Hurricane Andrew began as a tropical wave off the African coast, only to develop into a powerful Category 5 hurricane before making landfall in the Miami area. It made a second landfall in Louisiana a day later. Cheryl Juarez and her family huddled into a closet to ride out the storm in Homestead, Fla. The USA Today reports: "For hours, they heard the kids' jungle gym slam repeatedly against the two-story house. They listened as Andrew tore off the roof. Water crept into the closet — not through the gap under the closet door, but seeping in under the walls. 'I thought, 'Well, it's been a good life',' Juarez said. 'We were done.'" She and millions of other people who either had evacuated and came back or walked out of their damaged homes took in the immense destruction. Houses were broken into pieces, mobile homes piled on top of each other and in some places, it was just difficult to get around. "There was no signage, so directions were, 'You're going to go down to the pile of bricks on the side of the road, take a left at the broken sign...'"Julie Rochman told the USA Today. But Green remembers the looters. "And the police said, 'Shoot them,'" Green said. '"They said, 'We cannot police everything.'" Andrew topped the list of the costliest U.S. hurricanes at the time at $27.3 billion, not adjusted for inflation. Several passed it in the years since, including Katrina, Harvey, Sandy and Irma. In reaction to the storm, state lawmakers implemented new building codes requiring everything -- from the roof on down -- to pass hurricane-force wind testing. Recently, however, concerns rose about a change approved by the legislature and signed by Gov. Rick Scott. The update now no longer requires the state's building codes to be updated every three years, with supporters saying the code can be more flexible to keep up with changing technology and construction methods.